In addition to sleeping late (until 9 am), one of my Sunday rituals is going shopping at the Nyamirambo market up the street from my house. 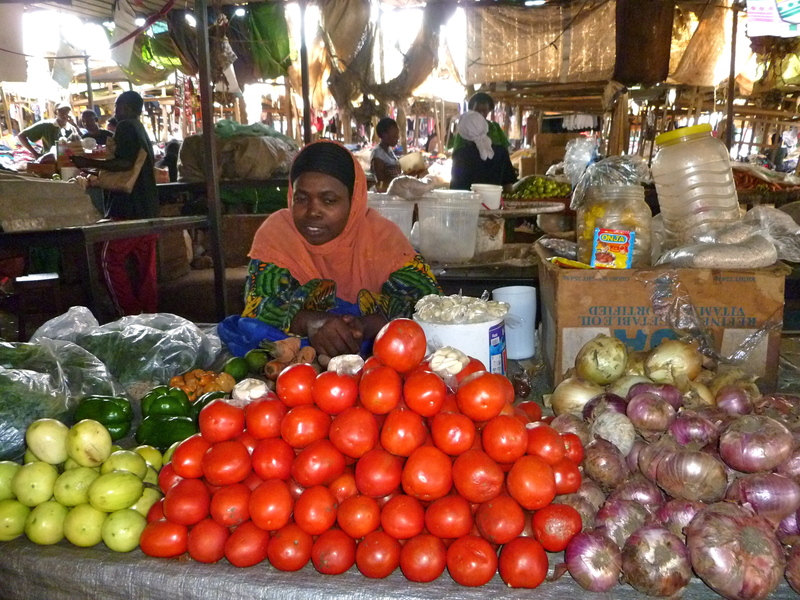 Kigali has about four or five markets, which offer mainly the same things at mainly the same prices (although the prices universally inflate about 20-30% for white skin). 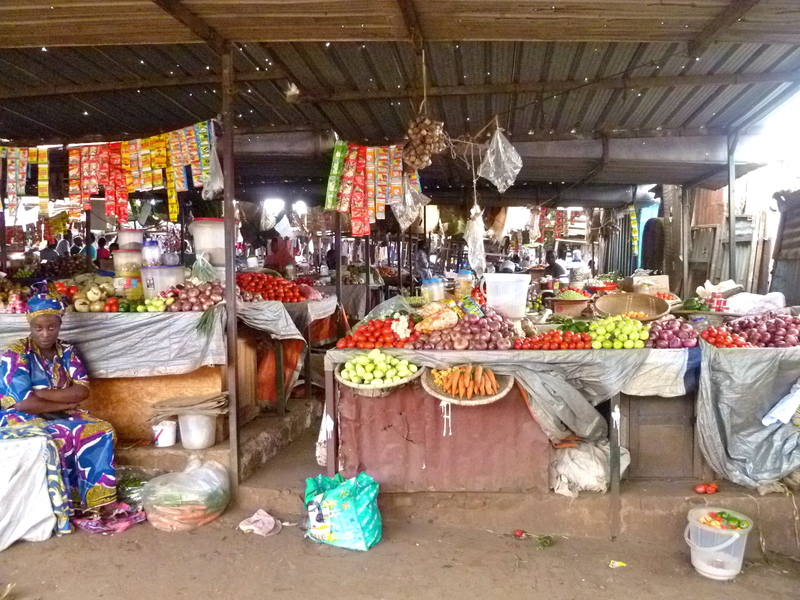 At the Nyamirambo market, there are about 50-100 vendors selling fruits, vegetables, meat, flour, eggs, home goods, cooking materials, clothing, shoes, sunglasses, fabric, charcoal, and more. Visiting the market is always a stimulating experience and it’s great to start off the week fully stocked up on fresh fruit and vegetables. 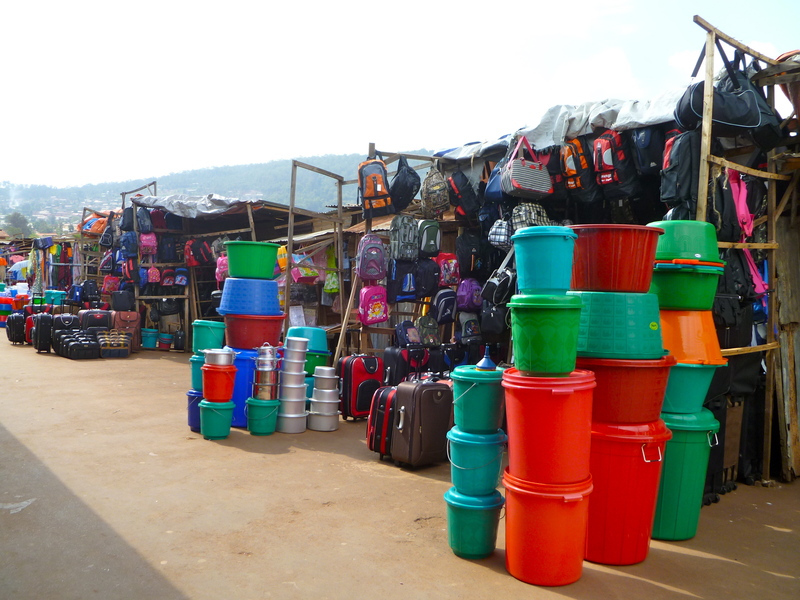 The market is organized in a sort of concentric squares structure, with vendors selling home goods, shoes, sunglasses, etc. lining the outer square. Passing into the wooden structure in the front of the market, you meet an elaborate series of vendors selling essentially the same vegetables. Sometimes I wonder why merchants don’t specialize and break up into unique clusters or cooperatives of potatoes, tomatoes, onions, etc. Following the laws of supply and competition, the prices are fairly uniform across all of the aisles. I suppose in the end it would be difficult to orchestrate and maintain a division of vegetable offerings. 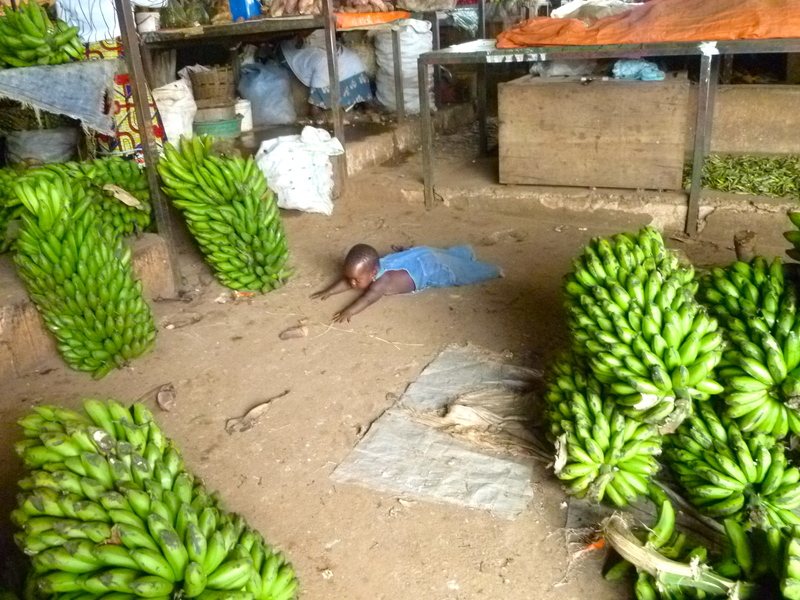 Going to the market as a mzungu has not been as overwhelming as I was expecting. People occasionally call out and hawk at me but are generally calm and let me browse through the aisles at my own pace. 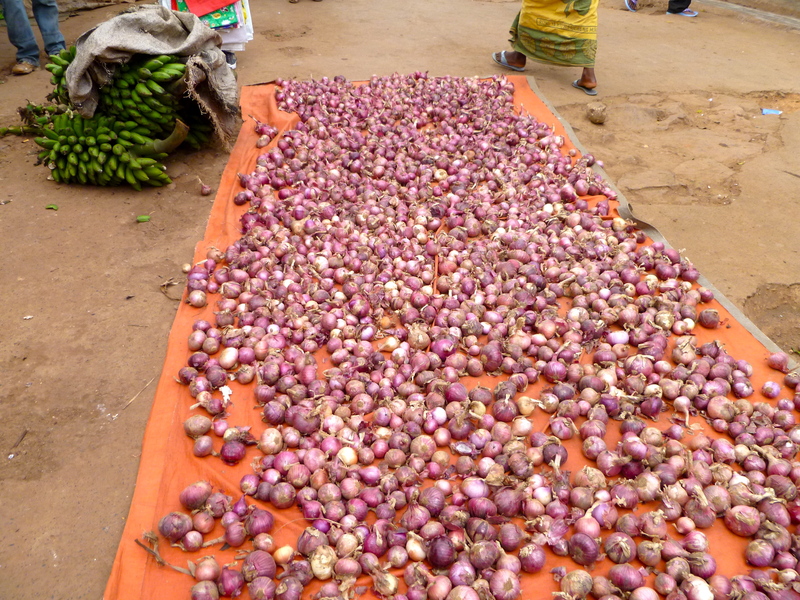 There are in fact a few merchants who stick to one or two vegetables and sell in bulk, like the onions below. Crossing into another wooden structure brings you to the fruit stands. 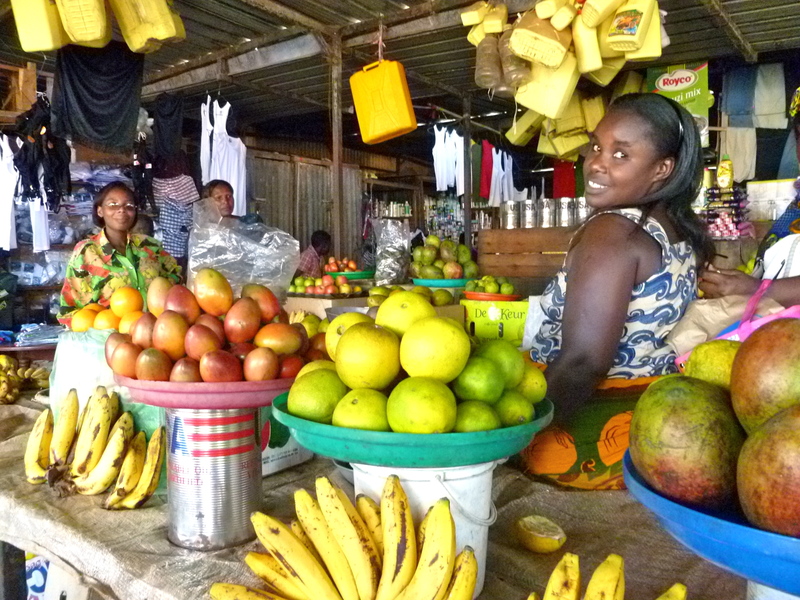 Here is a kind woman who sells me my mango and passion fruit. The reddish-yellow oval fruit on the left is some sort of tree plum which is quite bitter on its own but delicious in juice form. 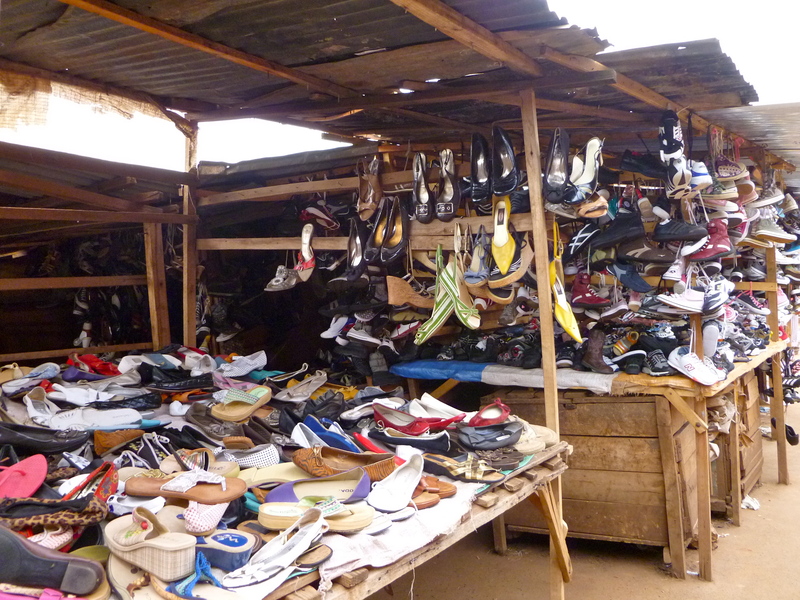 Heading toward the exit, you pass by several stands of used vintage shoes. 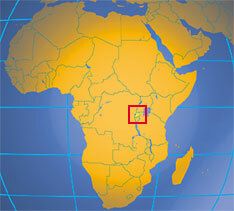 These most likely come from foreign donations that end up sold to merchants or given as surpluses. Although it makes westerners feel good, sending old clothing and shoes to Africa is actually one of the worst things we can do for local economies. It’s unique to have such an array of fresh and succulent produce at my fingertips in addition to fully stocked grocery stores where I can buy western comfort food like cream cheese and Rice Krispies (albeit at a premium). On that note, the bagels from Friday’s culinary adventure were a great success! I ended up eating all three of my bagels within 15 hours (two for dinner and one for breakfast…don’t judge.) As I was heading to a meeting in a new part of town yesterday I passed by a megastore with a banner that read “MADE IN ITALY: IMPORTED CHEESE, WINE, MEATS, OIL, SAUCES, ICE CREAM, AND MORE.” I have a feeling that will be my next grocery adventure! da pic of d lil’ kid is…thumbs up! Were any of the fruits and veggies imported? None of the fruits and veggies seemed to be imported, but some of the things like curry powder and other spices most likely were. On the Haiti note, there’s definitely the same issue with donated imports, as well as imported rice, that have driven Haiti’s economy into the ground. Just after the earthquake some aid organizations were discouraging clothing donations because clothing wasn’t the most urgent compared to food and water and ultimately it would continue to depress Haiti’s economy. In Haiti as well as Rwanda (and I’m sure many other developing countries) it’s such a status symbol to wear American clothing. The fascination and glorification of American culture manifests itself in rap music on the radio, Abercrombie and Fitch (used) clothing, slang people use, and more. I think it’s really a shame – although cultural diplomacy is great, it should be a two way street. Wow… So much food. 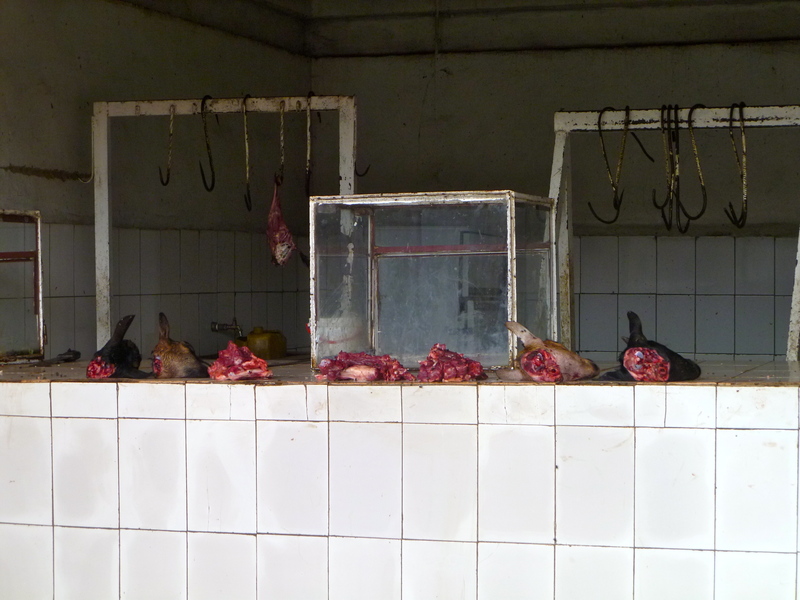 And tasty-looking, too (except for the green bananas and the goat heads… No thank you.) Much more impressive than my groceries (which I buy at the corner store, btw). Bill Easterly (aidwatchers.com) had a great post about the 1millionshirts guy, and another about Toms shoes. Both are worth reading if you like a) laughing and b) stories about why it’s not a good idea to ship clothing to Africa. Thanks, I definitely enjoy both those pursuits! I’ll check them out. How do I write to you with a message of not public interest? I’ve added Rachel to the list – she just has to confirm via e-mail now. I’m not sure how one would write a private message to me. Perhaps through old-fashioned e-mail.